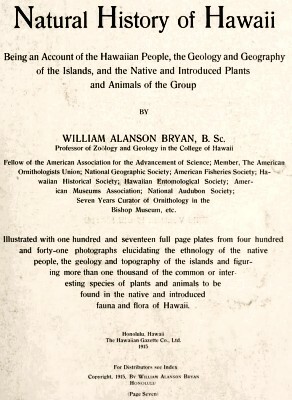 William Alanson Byran : Natural History of Hawaii , 1915. The Hawaiian Gazette Company, Honolulu, 1915. The illustrations are accredited on page 14. Plate 16, numbers 1, 3, and 4 are from diverse sources, including the Hawaii Promotion Committee. Numbers 2 and 5 are accredited to H. H. Henshaw, possibly from Hilo on Hawaii. Number 2, Showing the shape and size of the board, is remarkably similar, but not identical to a postcard published by the Hilo Drug Company, circa 1907. - DeLaVega: Surfing in Hawai'i (2011) page 33. 1. 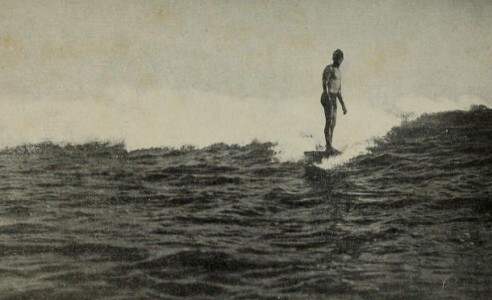 Hawaiian youth standing on the surf board [papa hee nalu]. 2. Showing the shape and size of the board. 3. Racing in the surf at Waikiki; Diamond Head in the background. and the connecting bars [iako] of hau and the gunwale [inoo] of ulu. The paddles [hoe] are of koa and kauila wood. 5. Two single canoes on the island. The hull of the canoe is always made of a single koa log. A sport which was justly popular with all clases was what might be called "summer tobogganing." It consisted in sliding down hill over carefully prepared slides, a few yards in width, on a long, douhle-runner sled. There are a number of these slides that are still pointed out as favorite coasting places of ancient times. Any smooth mountain slope of sufficient steepness would serve the purpose. The only complete sled in existence is in the Bishop Museum. The two runners of this one are each just over eleven feet in length and are three inches apart. They are firmly fastened to the narrow frame. The native tobogganer would lie fiat upon this curious sled, the papa holua, and give it a push with his foot, to start it off. accompanied with great danger to life and limb. Several of the old slides are more than a half mile in length, one on the town side of Diamond Head ran far out on the plain, and another still longer one is to be seen from King street, at the opposite end of the city of Honolulu. A favorite game in which women engaged with much skill, consisted in hiding a pebble, the noa, which was held in the hand, under one of five piles of tapa. It was for the opposing side to guess in which pile the stone was left, striking the pile selected with a rod tipped with feathers. There were also many children's games, such as flying kites, cat's cradle and jumping the rope. Being excellent swimmers from their youth the natives were as a race devoid of fear. They would leap from high precipices into the foaming surf below, fifty, sixty and seventy feet; and it is still common to see the swimmers and divers in the harbor leap one after another from the bridge or from the life boats of the largest ocean steamers. 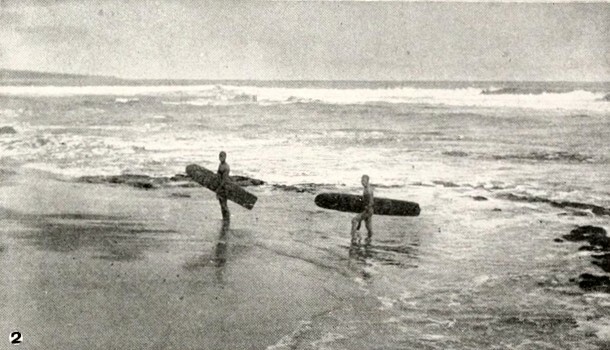 But riding the surf with the surfboard was and is still the favorite amusement, and an art in which the Hawaiians always exhibited wonderful skill and dexterity. For this amusement a plank, preferably of koa wood, known as a surfboard, was used. It was a coffin-shaped plank averaging about ten feet in length by a foot and a half in width, though they were occasionally eighteen feet or more in length, and from that ranged down to very small ones for children. Some were made of the very light wiliwili wood. They were always made with great care and were kept smoothly polished. The swimmer, with his board, would gradually work his way out through the shallow water, over the fringing coral reef to where the high rollers rise over the outer reef and follow each other in rapid succession over the table-like reef toward the shore. The more terrific the surf, the greater the pleasure to those skilled in the sport, a form of recreation that is enjoyed in these modern and more strenuous times by natives and foreigners alike. goes as planned, carries the swimmer and his board, at race-horse speed, clear into the shallow water at the beach. In this manner they disported themselves for hours at a time, returning again and again, often standing erect and gracefully poised on their boards as they were wafted in on the bosom of the foam-capped wave. Surf-riding extended to canoe racing in which the principle just indicated was even more elaborately applied. Strong crews of picked men would man their best type of racing canoes and pull out to where the surf began to rush over the reef. There amid the rush and dash of the sea, each crew would await the signal, when the race would begin, each man paddling furiously, until the canoes were caught by the waves, and amid wild shouts of exhilaration, scarcely audible above the ocean's roar, the successful crew would reach the shore, claiming the race, to the unbounded joy of all. 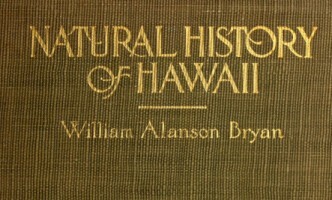 Geoff Cater (2013) : William Alanson Bryan : Natural History of Hawaii, 1915.